You are here: Home / Life and Inspiration / Outside The Box Anyone? In Los Angeles, California, a luxurious high-rise apartment building was on the brink of bankruptcy. Tenant after tenant turned in notice and moved out. To owners of the building, the mass exodus made no sense. Their beautiful, well-kept apartments offered a sound bargain in a safe neighborhood. So why were people abandoning what should have been a renter’s paradise? The building’s management company hired a problem-solving group to get to the bottom of the mystery. After interviewing residents and former residents, the problem-solving team presented its findings: People were moving out because the apartment elevators were too slow. A team of troubleshooters flew in to solve the problem. They gathered cost and labor estimates on several options, from repairing the old elevators to putting in new ones. But every option proved too expensive. Defeated, the management company had just about decided to sell the building, when the youngest member of the team took a creative look at the problem. The real problem, he suggested, wasn’t the elevators. The real problem was that tenants got bored waiting for the elevators. His solution? Entertain tenants who were waiting for the elevator. Install flatmonitor computer screens that flashed the day’s top headlines, weather, sports results, and even a trivia question or two. Pipe music into the elevator waiting areas. Add tasteful yet provocative paintings and sculptures to the waiting area to stimulate interest and discussion. His creative solution worked. The tenants, busy reading the computer monitor, soothed by relaxing music, or admiring the art, quit complaining. The exodus ceased. The building was saved. And one creative problem solver had made his mark. Presently I’m still working on moving old comments to past posts. I can see the comments on the Disqus panel in my blog but I don’t see them on the relevant posts. I’m working on it…. and I’m certain I’ll find a way out. Have you recently come up with an outside the box solution to a problem – – yours or someone else’s? I would love you to share your story here. That was pretty cool. I can’t say that I’m thinking outside the box… maybe sometimes, but mostly I like to lead a simplistic way of life. Thank you. I’m so glad to be surrounded by creative and bold people like yourself. I already see your blog as a reflection of you….It’s great to know that it’s only a part of who you are! We all get stuck with ourselves sometimes, figuring it out is the best part of living I think! You said it well, Edmund. Awareness and stepping back are key! So the real problem was a short attention span? We must entertain the masses! Haha…trust you to put another spin on the story, JR.
Love that story about the elevator !! We all have those days, Mary. I’m glad this ‘spoke’ to you. I think we all need to constantly look are reworking our routines and making sure we’re not getting too comfortable. I know the end result will be fab, @google-fa6d60ae2d8167c683aa10d45de3d03f:disqus . Glad you liked it, Sulekha. And you will find it, Irene. You are extremely intelligent and creative – just give yourself time. Thinking out of the box seems to be a natural thing for me in many regards…especially in the expression of my gifts…like gardening, design, cooking even writing. Sometimes I think people wonder if i even know where the box is…lol. I love pushing the limits, chalenging the norms and being creative. Now applying that to me directly is a bit different…I can get stuck there..
Great post.. As I read your post I find myself in that place where exodus is all I am thinking… How and what do I do to change it for me…. I’m sure you’ll figure it all out, Savira. Wishing you love and peace. Thanks. I am one who likes routine and have a meltdown at the mere mention of change. Thanks to the creativity of my beautiful wife, I am learning to step outside my comfort zone…baby steps at a time (smile). Thanks for a thought-provoking & inspiring post. Keep them coming. I love the elevator story and the example of creative problem solving here..especially thinking out of the box. Funny how sometimes the answers are right in front of our face, it just requires some awareness and taking a step back. this is a very cool and inspiring story…a toast to creativity…! I always enjoy reading stories of this nature, because we all have a different and unique approach to solving any problem. I wouldn’t automatically think people would choose to move (in large numbers) from a building because of a slow elevator, but we’re all different. I’d probably take it as a nudge from God/Universe/Spirit that I should give thought to using the stairs and getting some cardio in each day! I always feel happy when I visit here, partly because of that beautiful smile of yours and also because I just enjoy your approach to life in general. Much love to you, sweet girl! Haha @660cff7ac0bc06717d584a56e34bcac0:disqus I like the idea of prizes for taking the steps too! Fantastic mantra, @0222b9202f90703aefc992d687074d82:disqus ! Thank you. That’s a good idea too, Cindy. You are so right @google-6dabf3f0adf419f364ee5fc779aed43f:disqus – you do think differently and that’s what makes you, YOU. You are extremely creative, Rachel. Thanks for sharing! Ha ! Corinne ! I must learn to think out of my box, still in process, you are my inspiration, and I admire the way you keep exploring, your blog looks really beautiful and nice, thanks for the lovely post ! Thanks, @befa2dfeef799a6c6ca6f97264045c68:disqus ….You have always moved way out of your comfort zone…and you keep doing that time and again. Thanks for the compliments on the blog. I’ve always tried to color outside the lines and when I’m faced with a problem or issue I can’t handle I often come up with other ways to get things done. Honestly I’m facing something right now where I thought I was thinking outside the box, but I haven’t received the results I’m looking for just yet. I won’t give up though! Thanks for this Corinne. I am on the right track. I just know it! That’s a cool idea, @google-66c4bd6de0d379293f30d8d5d516fad3:disqus …I’ve been trying that too and it works real well. Well written and fascinating story! Loved this Corinne. I am sure you will also succeed in getting the comments to fall into place with their relevant posts. As for thinking outside the box has never been easy for me but I am sure I will sometime or the other. Love this message, you know I do! Oh don’t I know that about you, @google-3d38cb7d9d9e35f57bf9da55324ae303:disqus !! Great post and story comparing how to think outside the box. Can’t wait to hear how your personal dilemma gets solved. Thanks, @carlajgardiner:disqus ….Will keep you posted! Love it! This is my specialty and the one reason I’ll be out of poverty soon…something very few people actually accomplish–completely changing their trajectory in life. It’s thinking in completely new ways that makes the difference between success and failure….because successful people never fail, they just keep learning! So glad for you. It’s true what you say we have to look at things so differently in order to succeed. Corinne, I love this post. Sometimes what we think is the problem… really isn’t the problem at all. Sometimes we’re working overtime thinking in the wrong direction. Here’s the question I’m learning to ask: Where’s the opportunity in this? It’s amazing the answers sometimes you get if you change your perspective. Great question, @282f44fe9ce09027585c0784eeae7338:disqus …So right what you say, if we decide to see every experience as an opportunity to learn and grow, we will be really wise indeed. Corinne this was a fun read. I was thinking well maybe they should encourage using the stairs and even offer prizes to the fastest or something like that……well this is a better solution and very much out of the box. Creative thinking…actually I think many of my best solutions come from creative non-thinking. Great story that really stimulates the imagination. Thanks. I wrote a little story about thinking outside the box. I think it’s so important to exercise those creative muscles. You’re my hero for taking on the task of moving your blog. I’m still a little computer shy, but I am thinking of changing the name of my blog. Still thinking about it. Nice Blog Post. The cartoon at the beginning is totally me! I over think all the time! Always Always Always think outside of the box which will bring you to great achievements! Great post. Sometimes getting a fresh perpestive from someone else is the way to go. You inspired me too @twitter-297112305:disqus ! So thank you in return. Thinking outside of the box requires that all preconceived ideas be laid aside. I have a hard time doing this, but when I do, and I find a unique approach; I get a huge thrill out of it! Realizing I’m perpetually pummeled by (at least) low grade stress, like waiting for the slow elevator, I am experimenting with new stress-busting techniques using simple sense stimulation techniques. A hanky spritzed with Mr. C’s cologne tucked in my purse, the feel of prayer beads in my pocket, mini-vision boards I can carry with me are some of the possibilities I’m playing with to calm me throughout the day. I wouldn’t have associated stress with you @DangerousLinda:disqus …But you’ve come up with some great ways of beating it, I see. I naturally love the cologne idea the best 😉 Growth exercises – yes, of course. Bring them on, I say! What a thought provoking post! Thank you. I recently “stepped out of the box” with something and am anxious to see how it all turns out. Great post. Glad you took the ‘plunge’ out, @facebook-1250598092:disqus …Now don’t be anxious. I’m sure it will all turn out wonderful. Thank you for stopping by. The way to think outside the box is to eliminate the box completely! I sent both my children to a school that had no testing, no grading, no competition at all; no textbooks, no desks, no shoes! They turned the box upside down and out fell children who grew up tolerant, cooperative, loving. Fantastic, @facebook-588498900:disqus …. What a great example you are! I love brainstorming which does not necessarily solve the problem. But I enjoy looking at things from different perspectives although this is quite hard when emotions are involved. Its always astonishing to find how a tough problem can be solved with a simple solution. Stopped by after a long time. Love your new look, Corinne! Such a good point, Sukanya. Yes, brainstorming may not always solve the problem but it certainly puts us in the right frame of mind. Setting emotions aside can be a big problem, but that’s where being cool headed and mature comes in. Thank you for stopping by and for the compliment. I’m still getting used to this new space! Love the cartoon! I love to be creative and find ways to be different. 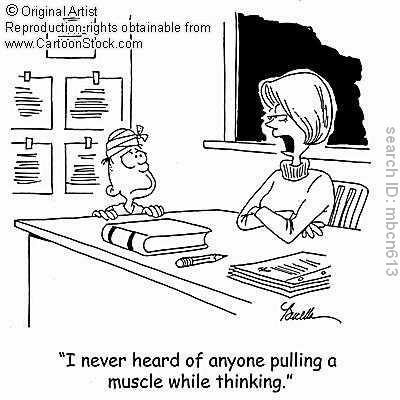 Sometimes I feel like I do pull one of those muscles! Due to the overwhelming amount of things going on that make my brain just go blank! Hate when that happens! You sound a lot like me, Dawn. In recent years though I’ve learned to relax a bit to prevent blank-outs. Thanks for stopping by and sharing. Wishing you good luck with your company! I love this post…great way to approach so many things in life and an important concept to teach our children. Looking outside the box for answers stretches the mind and our imagination! Thanks! I think that children naturally think outside the box, it’s we adults who curb their imagination most of the times, Denny! Oh you know Corinne…sometimes, I feel so settled with the things I can do but my superiors see that I could do a lot more. Recently, I’ve been given a task to make ppt presentations for my boss. It has always been my brother who did them for me but this time, the boss gave the project directly to me.It ate up most of my time but I was able to put things together and not only that, I also learned to create a video and convert files and music. I’m glad you stepped out of your comfort zone, Melissa. It’s amazing how we undervalue our own capabilities until we’re pushed to the wall! Nice post Corinne….my box is locked right now and am searching for the key. Which means you can’t get inside it, @7fb89d8628d78dfa927fb398e7645bdc:disqus – so you must be thinking outside it. If you find the key – throw it away!